In 2014, the first ever Savanna designed and built triple drilling rig series was unveiled. These 1500 horsepower rigs are truly impressive using the latest in drilling technology such as automated catwalks and touch screen command centres. VELOXTM rigs employ hydraulic-based assembly efficiencies designed to dramatically REDUCE move times traditionally associated with rigs in this class. Three VELOXTM platforms: 355, 360, and 375, come with hookloads of 550,000lb, 600,000lb, and 750,000lbs respectively. See the automated features in action. 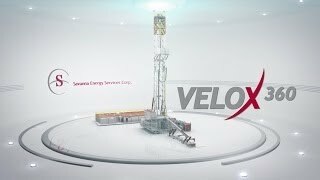 Velox is a Latin word meaning fast, rapid, or quick, and while it was chosen to brand Savanna’s new deep drilling long-range platform, it also aptly describes our rig building philosophy. FAST Velox is a Latin word for quick, fast. Velox™ triples are lighter, faster, and equipped to mobilize and set-up safely with minimal manpower. All three platforms move on the X&Y axis with a pad configuration and optional umbilical mud system. DEEP All three Velox™ platforms are capable of drilling deep horizontal wells safely and quickly. SAFE Automation and technology in today’s drilling environments are truly remarkable. Savanna’s Velox™ triples employ Iron Roughnecks, Hercules Hydraulic Catwalk Systems, and AC Drawworks for precise control and automatic fail safes.